Fowey (pronounced Foy) is a lovely old fishing village full of character with many narrow streets, lots of lovely eating places, watering holes, groovy shops and art galleries. 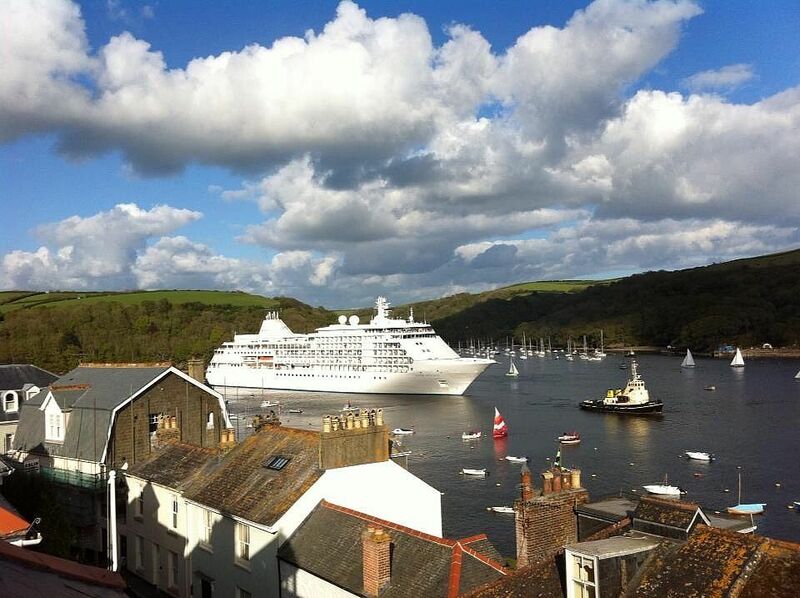 Fowey is more a sailing port in recent years and has a large sailing community passing through which gives the place a buzz all year round. If you like places with lots of character, culture, good food, beer and company, this is the place or you. En-suite bathroom has bath/shower, wc and basin. Shower room has a shower, wc and basin. Open plan living room with TV/DVD/CD, gas fire, slection of books and DVDs, three seater sofa, foot stool and two swivel chairs to enjoy the view. We are both golfers, but Phil is a good golfer and enjoys the stunning views and the challenge of playing on the coast. Phil recommends: Carlyon Bay (15 minutes), Trevose (45 minutes) and St.Mellion which is a bit of a trip (60 minutes) but is a Jack Nicklaus course and also has spa treatments for the girls. The nearest to Izzyminx Seaview are Carlyon Bay, Lanhydrock and Lostwithiel, all are lovely. Notes on accommodation: Izzyminx Seaview has stunning views and is in a fabulous location. There are no hidden costs, the bed linen and towels are included. Well behaved dogs are welcome. Free WiFi. The apartment is up a few steps, so it is not suitable for anyone who has difficulty with steps. Unsuitable for children under 5 years old due to the balcony. Outside: Enclosed courtyard with outside tap for sandy feet and muddy dogs. Utility room with washing machine and somewhere to store wet boots, coats and wetsuits. Utility Room: Washing machine Cleaning / Towels / Linen / Maid service: Bed linen, towels, tea towels, dish cloths/scourers are included. Property cleaned at the end of your stay. Where we’ll be retiring to! A lovely, sympathetically renovated property with excellent views across the estuary to Polruan and out to sea, from the large bay windows and balcony. The owners are friendly and approachable; booking was easy, with excellent communication, and the owners kindly agreed for us to take our well-behaved cat with us who also seems to have had a great week in Fowey. The property is a very short walk from local beaches and the unspoilt town centre of Fowey with it's broad range of shops, galleries, pubs and restaurants. I would have no reservations at all in recommending this property to a friend or relative. Whitehouse beach about 2 minutes walk, great for short dog walk in the morning, W.C.
Readymoney beach is about 10 minutes walk, ideal for kids with wc and ice cream van. Lovely sandy beach at Polkeris ideal for kids with café and W.C.
Big sandy beach at Par – Dog friendly all year round. Train - Train service between Penzance and London Paddington stops at Par which is about 10 minutes taxi ride. Bus – Number 25 bus goes to Par station (free car park) to Fowey and drops at the Safe Harbour Pub which is about 7 minutes walk. Newquay Airport - 40 minutes.